Cold and flu are the common symptoms in winter season. A cold is a viral infection in your respiratory tract, nose, and throat. Cold includes lots of symptoms like stuffy nose, sore throat, congestion, headache, fever and fatigue. You may be prescribed nasal decongestant, anti histamines or pain killer for this from Allopathic doctors. But simple home remedies can correct the problem. Herbal teas are very much effective for early relief of cold symptoms and fight against the infection. Some common herbs in your kitchen can boost your immune system and make you feel better. Herbal treatments help your body heal itself and boost natural immunity. Herbal drink is such a refreshing mode for keeping your every health problems. 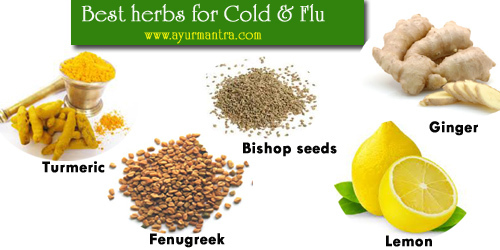 Same as for cold, cough and flu some herbs like Ginger, turmeric, Bishops seed, Fenugreek, Lemon are the best herbs against infection. Instead of taking chemical pills you can collect these basic herbs, mix well and boil. Drinking the formulated herbal drinks 2-3 times a day is enough to balance your body. Any of these single herbs is stronger against cold. Ginger is very good remedy for cold and flu. It may reduce inflammation, relieve pain and expel mucus. Ginger is best soothing substance for common cold. It may ease pain of a sore throat, headache and make easy to breath. Take 2 small pieces of ginger and boil with a glass of water. Note: Ginger is not recommended in hyperpyrexia condition. Turmeric is best anti infective herb. It is best alternative cold remedies. It contact active ingredients, Curcumin which help for strengthening body immune system. So it is best cold remedies for irritated throat. Mix 1/2 teaspoonful of turmeric with a glass of water and boil well. You can drink this twice a day. Lemon is the rich source of Vitamin C also a natural antioxidant and immune modulator. It has antiviral, antibacterial properties. So it is best remedy for cold and related symptoms. It heals quickly sore throat, headache, chest congestion, fever and chills. Drink hot lemon juice two/three times a day. Bishop seeds are the excellent remedy for respiratory infection. It is best cure for sore throat, cough and acute pharyngitis. Drinking bishop seed soup relief cough and cold. Also gargling bishop seed helps to protect against infection. Boil 1/2 teaspoonful of bishop seeds with a glass full of water and drink twice a day. Fenugreek is the best kitchen herb for cold and cough. Fenugreek seeds may dissolve mucus in your lungs, throat and sinuses and best cough expectorant. It is the best remedy for laryngitis or sinusitis. It is also called “winter elixir” which shows antiviral properties. in your page ” remedy for cold’s the instructions are not clear, make sure you let your readers know that once they boil the seeds, they can strain and drink the water, your methi seed information has mention of bishop seed in the end, you may want to edit your material or reread everything before you publish..